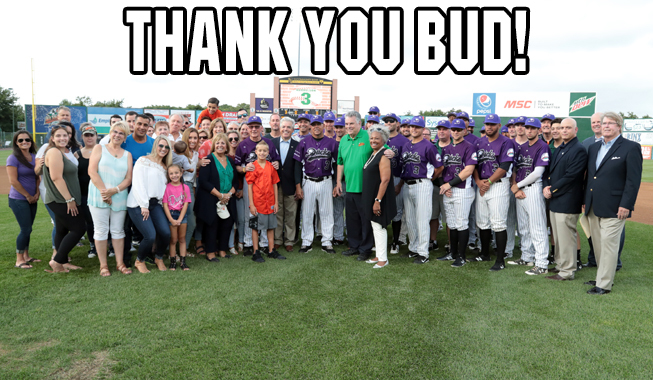 (Central Islip, N.Y., Aug. 3, 2018) – The Long Island Ducks hosted “Bud Harrelson Appreciation Night” at Bethpage Ballpark, presented by the Alzheimer’s Association, on Friday, August 3rd during their game against the Road Warriors. The night was highlighted by a special pre-game ceremony honoring the baseball legend and all that he has meant to the Ducks organization, the fans and to Long Island as a whole. Ducks broadcaster Chris King emceed the festivities on the field, where many of those close to Buddy shared great tributes and memories regarding the Ducks co-owner/coach. Speakers included Buddy’s daughter, Kassie, on behalf of his family, Ducks field manager Kevin Baez on behalf of the team, and Ducks founder/CEO Frank Boulton on behalf of the organization. Thank you messages from several others close to Harrelson were also played on the DuckVision video board. Following the speeches, Boulton helped the fans count down to the retirement of his #3 Ducks jersey, the same number he wore during his 13-year career with the New York Mets. A permanent plaque was unveiled adjacent to the DuckVision featuring a large baseball with “HARRELSON” and his #3 featured. He became the third Ducks player or coach to receive the honor after outfielder Justin Davies (2005-06) and infielder Ray Navarrete (2006-13) had their #4 and #16 jerseys retired, respectively, in 2015. Harrelson, the Ducks Senior VP of Baseball Operations and part owner, has been a member of the coaching staff since the team’s inception in 2000. After leading the Ducks to an 82-58 record as manager in 2000, the California native moved to the position of first base coach for home games in 2001 and has served on the coaching staff since. During that time, he has helped lead the Ducks to three Atlantic League championships (2004, 2012, 2013). Prior to his career with the Ducks, Harrelson enjoyed a 16-year Major League career that included a World Series championship in 1969, a Gold Glove Award in 1971 and a National League championship in 1973, all with the Mets. He also served on the Mets coaching staff during their 1986 World Series championship season.